Stechford station in Birmingham is being fitted with new lifts, ramps and a footbridge to make it more accessible for passengers. Jess Phillips MP visited the site on Friday 5 April to see the progress on the £3.9m project so far. 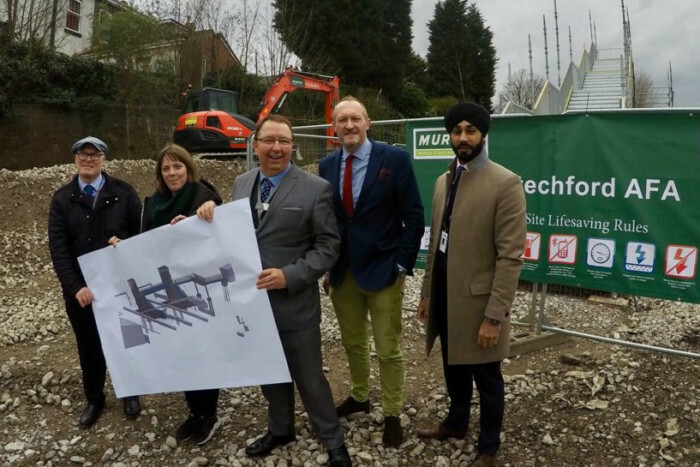 Stechford stations is being fitted with brand-new lifts, ramps and a footbridge to make it more accessible for West Midlands Railway passengers. Jess Phillips MP visited site today (5 April) to see the progress so far. Work started in March to provide step-free access across all three platforms for the first time. A temporary footbridge is currently being built on site to keep passengers moving while the new lifts, ramps and footbridge are installed. The multi-million-pound upgrade to make the station accessible for everyone will be complete by the end of 2019. The station, located on the West Coast main line between Birmingham New Street and Birmingham International, has regular direct services to and from London every day. The investment has come directly from the Department for Transport’s ‘Access for All’ programme, which was launched in 2006 to improve accessibility at railway stations nationwide. It forms part of Network Rail’s multi-billion-pound Railway Upgrade Plan, which is the biggest investment in the railway since the Victorian era. Harpreet Singh Moore, Network Rail scheme project manager, said: “The accessibility improvements at Stechford station form part of our Railway Upgrade Plan. Network Rail will unlock the railway network for many people in and around Stechford, allowing them easy access to travel that was previously not possible. Several more West Midlands Railway stations have recently been selected to benefit from the next wave of ‘Access for All’ funding. Smethwick Rolfe Street, Wellington in Shropshire and Worcester Shrub Hill were among 73 stations nationwide announced by the Department for Transport last week.